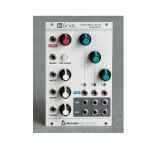 Notes: Blinds is a 4-channel voltage-controlled signal polarizer. Each channel consists of a polarizer circuit, also known as a four-quadrant multiplier. This circuit acts like a VCA, except that a negative control voltage will cause the output signal to be inverted, instead of being silenced. Blinds' outputs are daisy-chained, allowing adjacent groups of 2, 3, or all 4 channels, to be mixed together. One can think of Blinds' as a voltage-controlled version of Shades, the control center for all the modulation CVs used in a patch. Many other uses are possible, though. For example, each individual channel can be used to scale/offset a CV; and with audio rate modulation signals, each channel acts like a ring-modulator, with massive potential for drones and feedback patches. Notes: A Bernoulli gate takes a logic signal (trigger or gate) as an input, and routes it to either of its two outputs according to a random coin toss. The knob controls how fair the coin toss is - with the knob in minimal position, the first output always win, with the knob in maximal position the second output always wins - with random fun in-between. And obviously, this bias is CV-controllable! Notes: Elements is a full-blown synthesis voice based on modal synthesis - an under-appreciated flavour of physical modelling synthesis with a strange and abstract feel. Elements combines an exciter synthesis section generating raw, noisy sounds characteristic of bowing (filtered friction noise), blowing (pitch-controlled granular noise), or striking (stick, mallet, hammer or brush sample playback... or bursts of synthetic impulsions). These sources, or external audio signals, are processed by a modal filter bank - an ensemble of 64 tuned band-pass filters simulating the response of various resonant structures (plates, strings, tubes...) with adjustable brightness and damping. A stereo ambience reverberator adds depth and presence to the sound. All parameters have a very meaningful and well-delimited impact on the sound. When designing Elements, great care has been taken in selecting parameter ranges and control curves, producing a large palette of sounds - often beyond physical realism - but always well controlled and stable. The "dark spots" of noise and feedback are reached gradually, and they do still react to controls. The module is deliberately menu- and switch-free - what you dial/patch is what you hear! Notes: Take the user interface of an euclidean sequencer, a healthy dose of machine learning and graph algorithms, megabytes of drum loops, hours of intensive computations and you've got a drum pattern generator like no other. Notes: Links provides 3 utility functions focused on signal distribution and mixing. 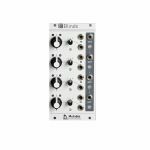 Notes: Ripples delivers a classic, big-sounding analog four-pole filter in a small 8-HP package, continuing Mutable Instruments' lineage of warm and tasty filters started by the Shruthi SMR4 mkII and 4-Pole Mission. Notes: Shades provides 3 channels of audio/CV processing which can be configured either as active attenuators or as attenuverters. Leave channel 1's input and output unconnected, and connect a CV source to channel 2's input. Channel 2's output will contain a scaled and offset copy of the input CV. Channel 1's level knob will control the offset and channel 2's level knob will control the signal scale and polarity. Notes: Streams provides two channels of extremely flexible signal dynamics manipulation. The EXCITE input is processed by a digital model of a resistive opto-isolator (Vactrol), controlling the gain and the filter cutoff (in variable amount). The digital emulation allows the modification of properties of opto-isolators - such as response time - which are otherwise difficult to control. The virtual vactrol response can be either optimized for processing CVs, or triggers (for "plucked" sounds). Streams' VCF is disabled, and the VCA is used to control the dynamics of the input signal. 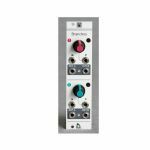 An intuitive control scheme allows the compressor to be used either for peak reduction/limiting operation; or for boosting signal levels with soft-limiting. 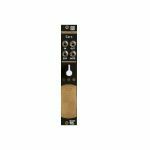 The EXCITE input can be used as a sidechain. Notes: Evolved from the oscillator mixing section of Mutable Instruments' desktop hybrid synths, Warps is designed to blend and combine two audio signals. 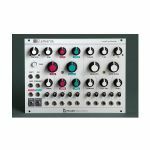 A variety of wave-shaping and cross-modulation methods - some of them emulating classic analog circuits, some of them purely digital - are provided by the module. Since many classic cross-modulation effects work best when the carrier is a simple waveform - for example, a sine wave for ring-modulation or a buzzing waveform for vocoding - Warps includes a digital oscillator offering a handful of classic waveforms. This internal oscillator, which tracks V/Oct and supports through-zero FM, will replace the carrier audio input - freeing up one oscillator in your system for other duties! Notes: Yarns is a MIDI interface providing up to 4 channels of CV/Gate conversion, and providing some of the MIDI message processing features of Mutable Instruments' MIDIpal, including arpeggiator, euclidean sequencer, and a SH-101 inspired step sequencer. The 2 and 4-voice modes are available both in a "polyphonic" and "multitimbral" flavour. The former receives chords from one single MIDI channel and dispatches them to the voices; while the later provides independent monophonic parts - which can be addressed to different MIDI channels, keyboard ranges, or even velocity levels. Various note priority modes (low, high, last) and polyphonic allocation schemes (voice-stealing, random, cyclic) allows you to fine-tune the CV/Gate conversion to your playing style. Each voice has a built-in digital LFO to interpret modulation wheel messages as a vibrato; can respond to pitch-bend messages; or can be smoothed with a glide/portamento control - no need for a dedicated module and patches to get the right response from a MIDI keyboard!